The introduction of digital technologies to the printing discipline has simultaneously revolutionized the industry and ushered in an era of continuous improvement, as these capabilities are both transformative and constantly evolving. This two-day seminar will get you up to speed on the latest technologies and help you stay current on market trends. Learn from digital printing experts on the impacts of converting from conventional to digital technologies, the limitations and capabilities of digital printing, and the business opportunities and competitive advantages digital printing could offer your products and services. Interested in training a large group? Contact us about custom seminars. Understand the critical difference between conventional and digital printing. Observe in lab demonstrations of digital commercial/specialty, label & packaging presses. Overview of HP Indigo, Kodak NexPress, Xerox iGen, and wide-format inkjet (Canon, Epson, HP, Roland) technologies. 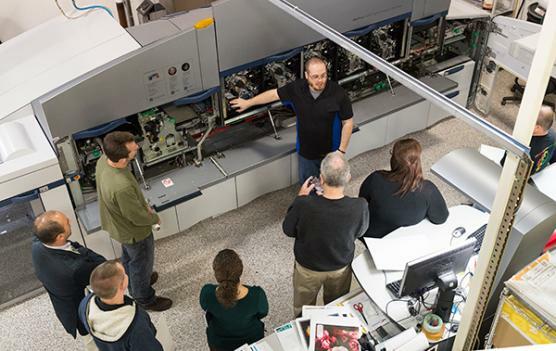 Learn the limitations and capabilities within digital printing, including media requirements for certification programs. Learn how usability and end use of the product fits with digital printing. Recognize the importance of communication throughout the printing process. Applicable to all levels of digital print knowledge. Eric T. Kunsman is a photographer and book artist based out of Rochester, New York where he has returned to pursue his personal work. Eric is a Lecturer for the Visual Communications Studies Department in the National Technical Institute for the Deaf and also teaches for the School of Photographic Arts & Sciences both of which are housed at the Rochester Institute of Technology. He was formerly an Assistant Professor at Mercer County Community College where he was also the coordinator of the photography program. He has nationally taught workshops, lectured on digital printing. Eric holds his MFA in Book Arts/Printmaking from The University of the Arts in Philadelphia, and holds an MS in Electronic Publishing/Graphic Arts Media, BS in Biomedical Photography, BFA in Fine Art photography all from the Rochester Institute of Technology in Rochester, New York. His photographs and books have been exhibited internationally and are in several prominent collections throughout the United States. He currently owns Booksmart Studio, which is a fine art digital printing studio specializing in numerous techniques and services for photographers and book artists. Daniel Clark is the Manager of PAL’s Print and Materials Analysis lab at RIT. Dan provides quality assurance and materials characterization support to material manufacturer’s, printers, and brand owners. Dan also provides trouble shooting of printing issues for the printers, manufacturers and suppliers in the graphic arts field. This is achieved through the administration of industry standard material and print performance testing, color measurement, image analysis and the use of other laboratory instrumentation within a TAPPI standard T402 environment. Dan has also has co-authored technical papers, presented at various industry conferences, and instructs in industry seminars and academic classes on the technologies, variables and their interactions in different printing process. Dan has over 32 years of experience in web offset & digital press operations. John Dettmer is the Printing Applications Laboratory’s Digital Systems Technologist. He specializes in digital and conventional prepress workflows, as well as HP Pantone special ink formulation and production. John has been involved in PAL’s Digital Printing program since November of 2000. He holds a Bachelor of Science degree in Printing Technology from RIT and is currently pursuing a Master’s degree in Web and Database Development. RIT has made arrangements for seminar attendees to reserve rooms at a special rate at the following nearby hotel; however, we suggest you make your reservations as soon as possible. A shuttle will be provided to take you to and from the hotel.